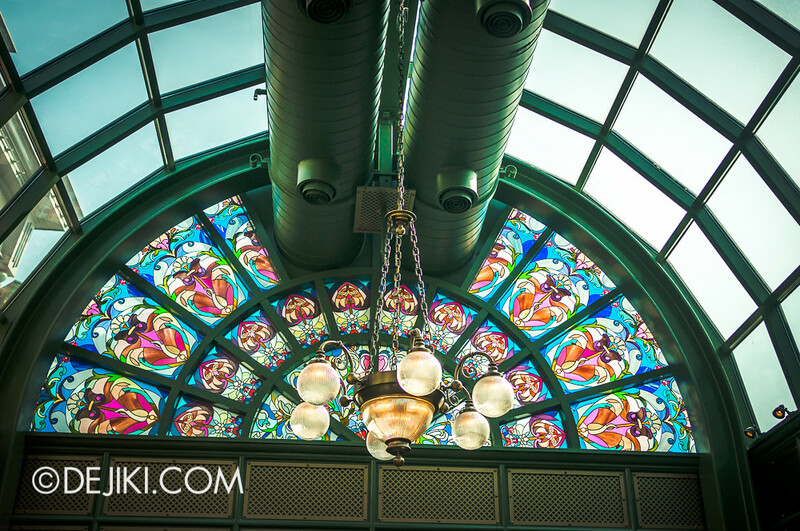 Photos in this entry are captured at different times of the day, thus pardon the changes in lighting throughout the post. 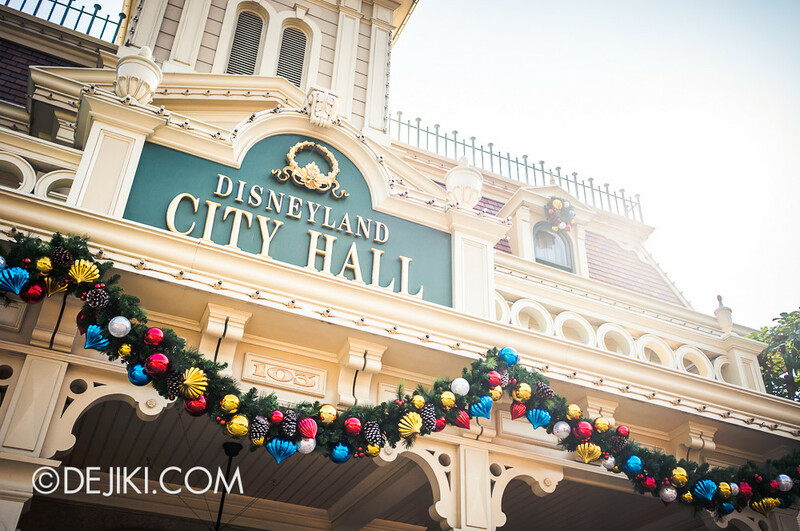 For a more detailed overview of Main Street, refer to this entry. 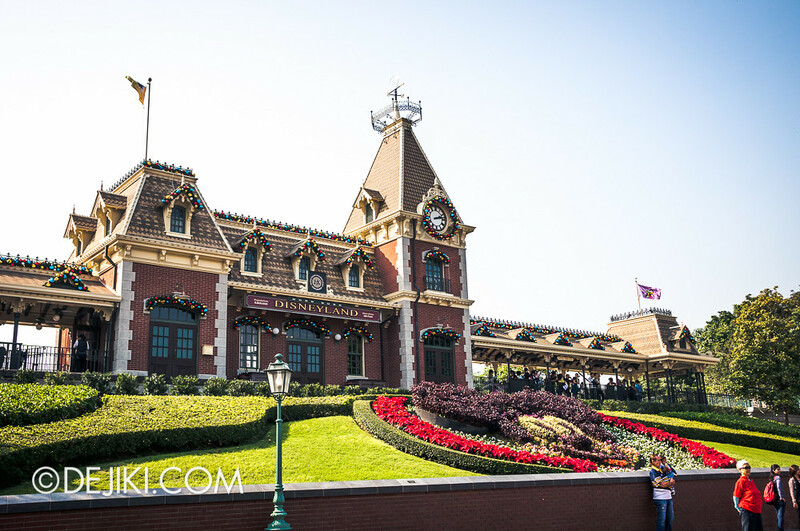 There’s always that certain Disney magic in the air when you see the Disneyland Railroad Station. 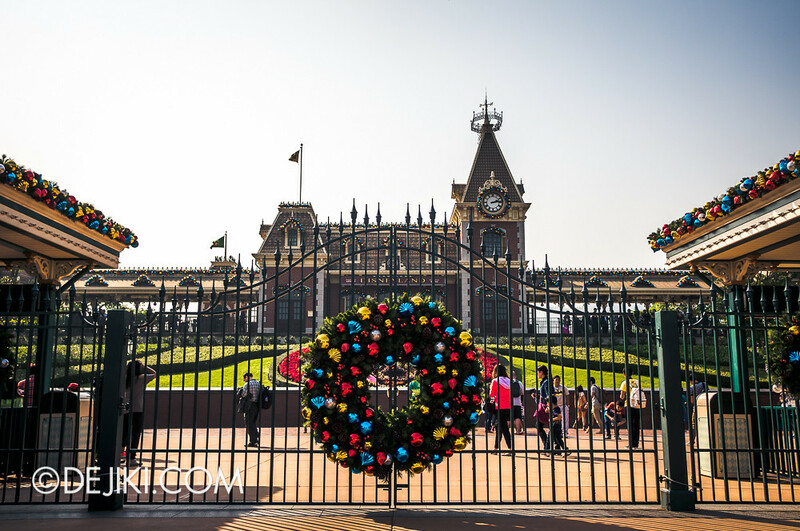 This year’s christmas decorations are bolder and more elaborate than in 2012. More ornaments (of many colours!) and denser evergreens! We’re in! We had clear skies during our visit. Quite windy at times, so the sun was enjoyable. 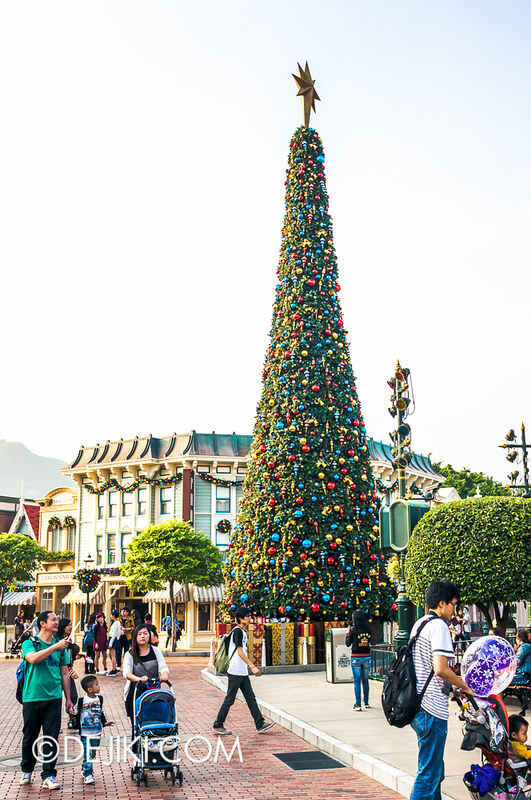 The majestic Hong Kong Disneyland Christmas Tree – the Heart of Christmas Town! 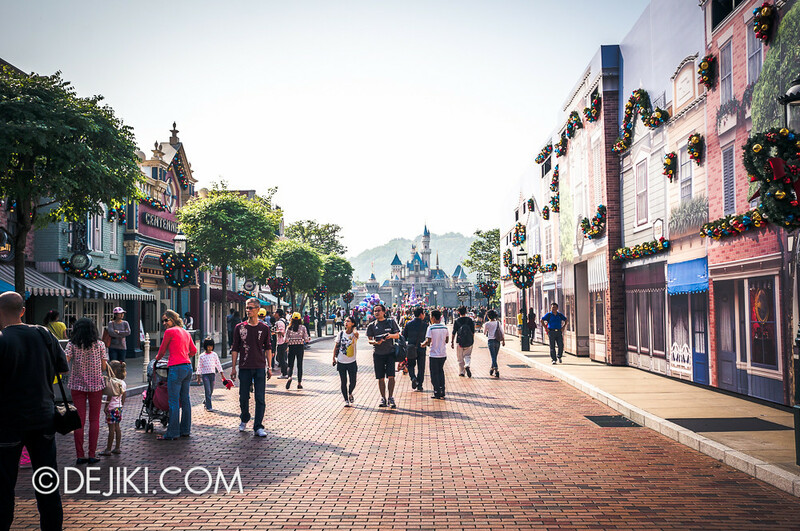 The right side of Main Street, U.S.A. (towards Fantasyland) is covered up for refurbishment. 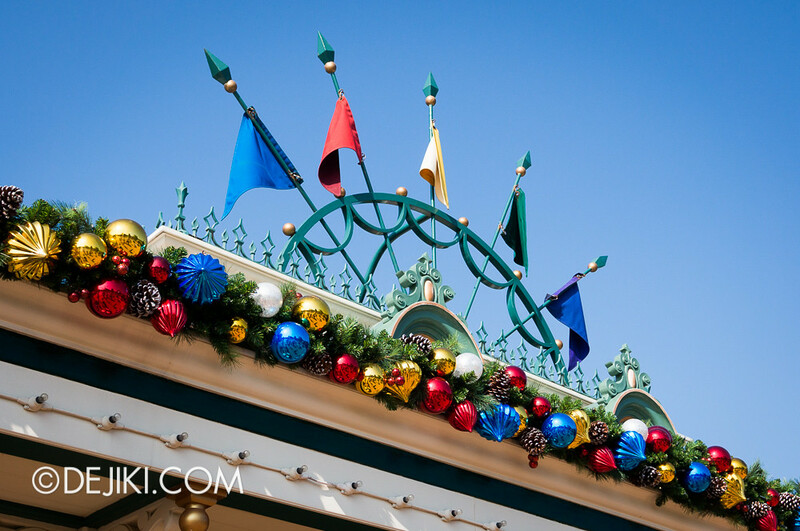 It’s interesting to see Christmas decorations hanging off the themed walls. 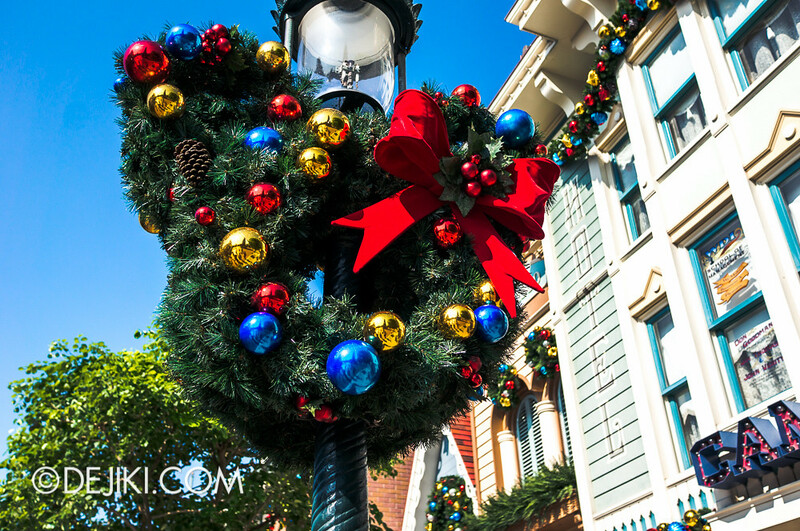 Every street lamp at Main Street, U.S.A. has a Mickey-shaped wreath. 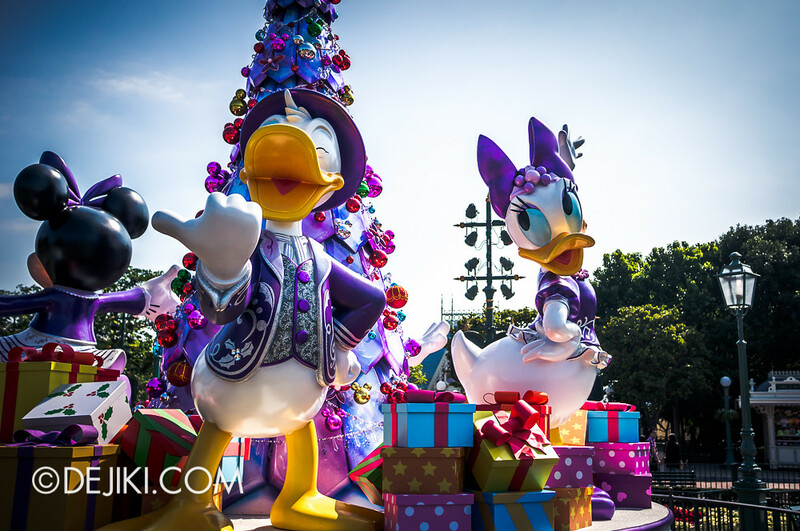 This year Mickey, Minnie, Donald and Daisy, in all-new festive costumes, can be found at the Castle Hub, in front of Sleeping Beauty Castle. 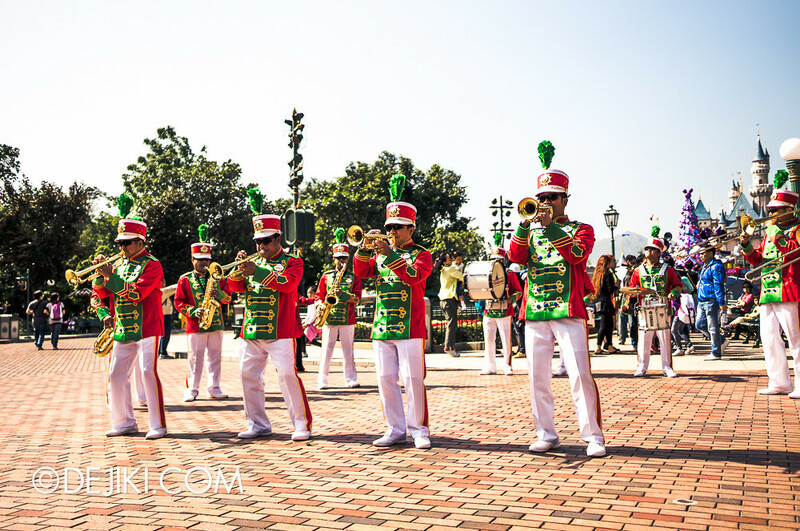 We caught a morning performance by the Hong Kong Disneyland Band. 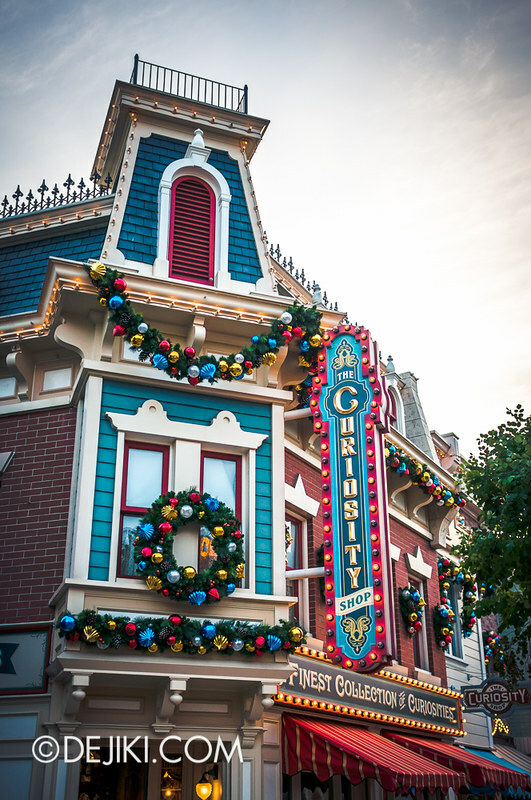 Popular Christmas tunes and classic Disney songs were performed. 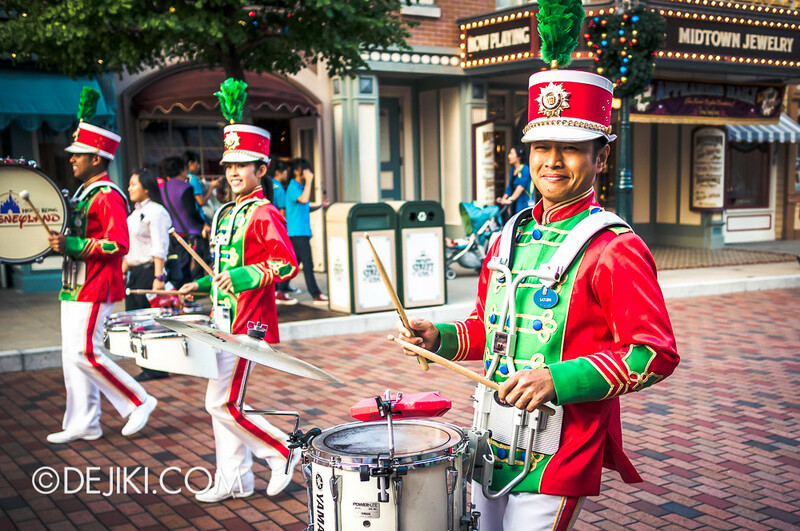 Chanel from Sakura Haruka was invited to conduct the Hong Kong Disneyland Band! 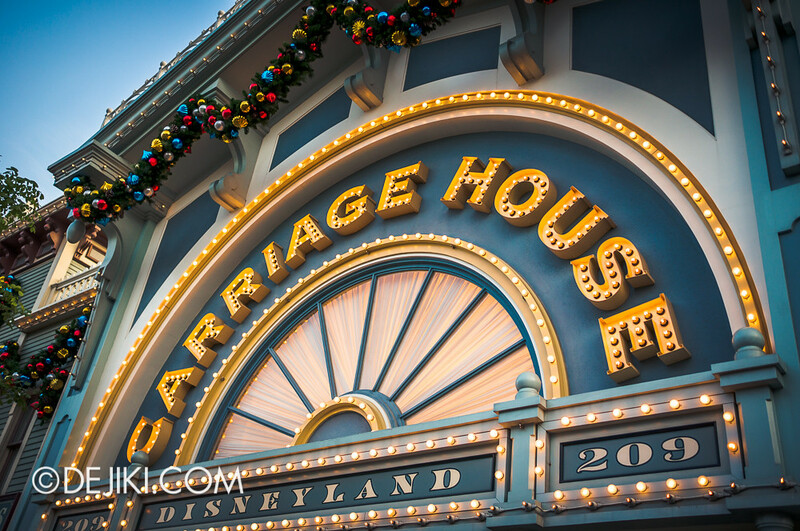 Cast members around the park may have a special pin on their name tags – these are service awards. 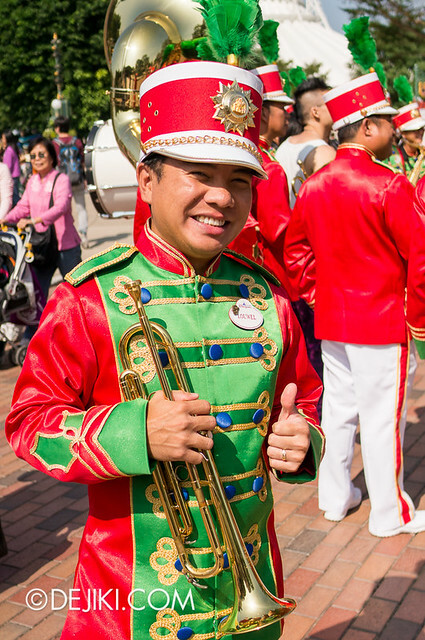 Louwel, who plays the trumpet in the Disneyland Band, has the Steamboat Willie pin. This particular band member (by the way, his name is Saturn) has a blue name tag. 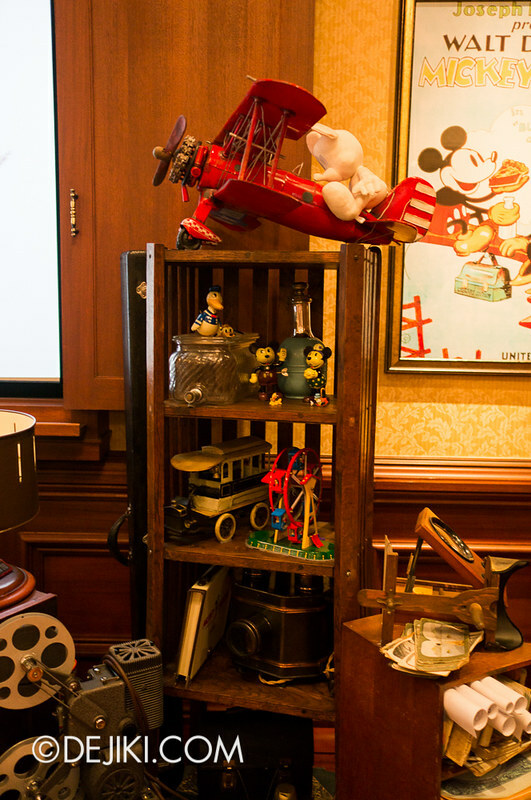 He is a recipient of a rare award: The Walt Disney Legacy Award. 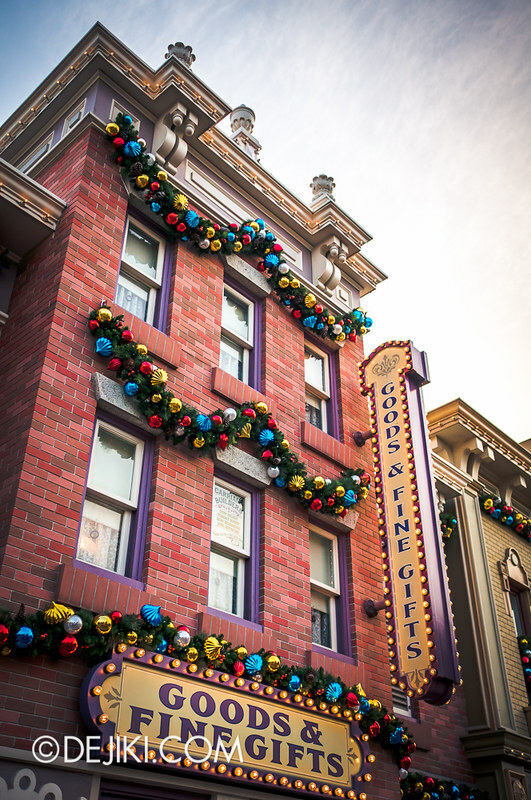 Let’s go back and look at the beautiful building facades around Christmas Town. 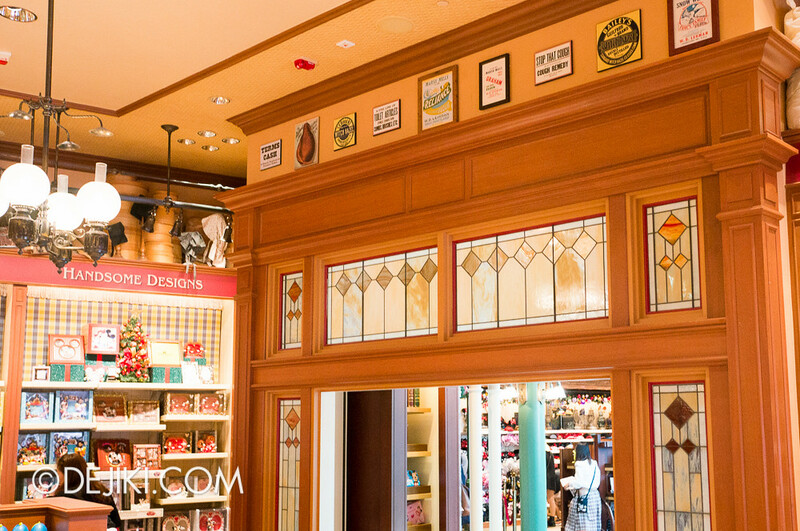 Step in, and you’ll find stores filled with irresistible goodies. 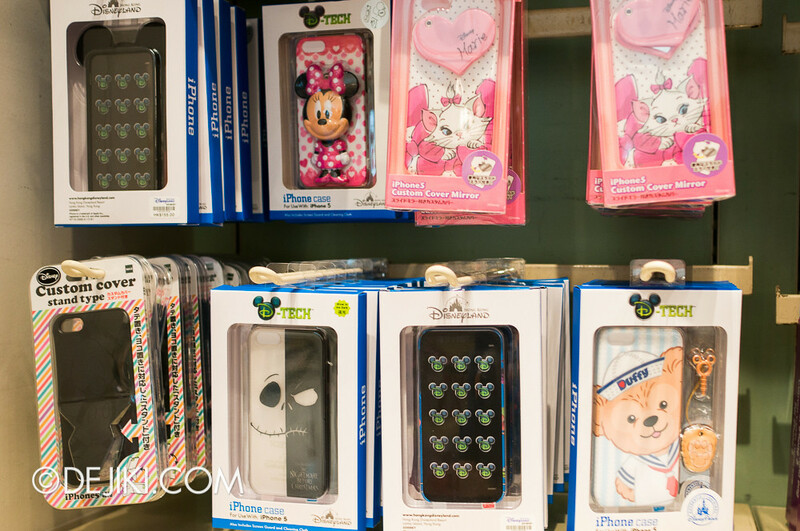 Phone and tablet cases! Lots of unique designs for popular devices from Apple and Samsung! 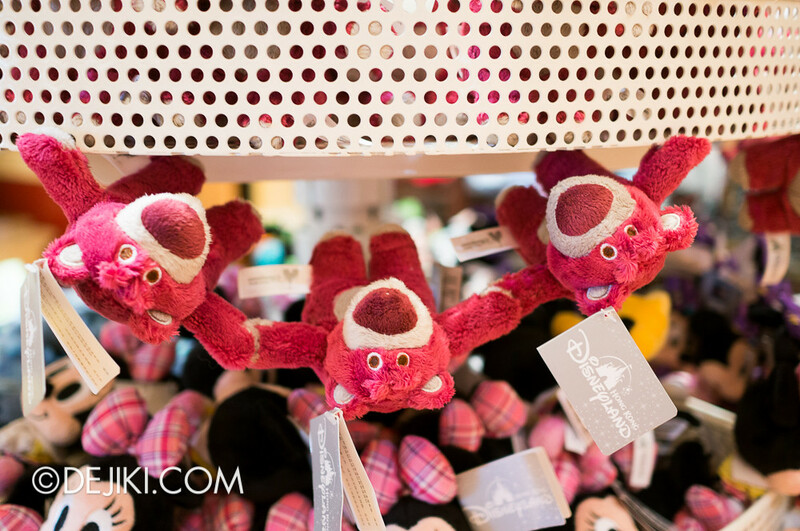 A trio of Lotso mini plush toys. The entire rack is filled with these mini plushies. They have magnets in them so you can either connect a few of these toys together or stick them on magnetic surfaces. Too many choices, too little time. 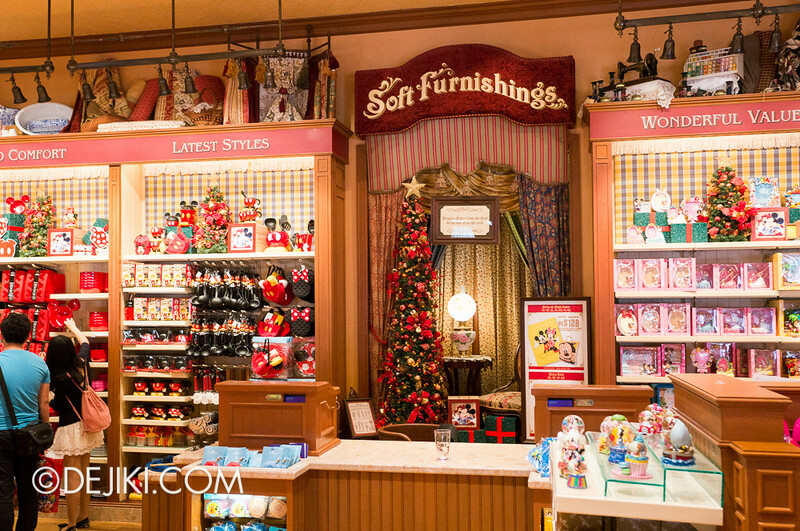 Even after spending more than an hour shopping here, we still feel like we forgot to buy something. 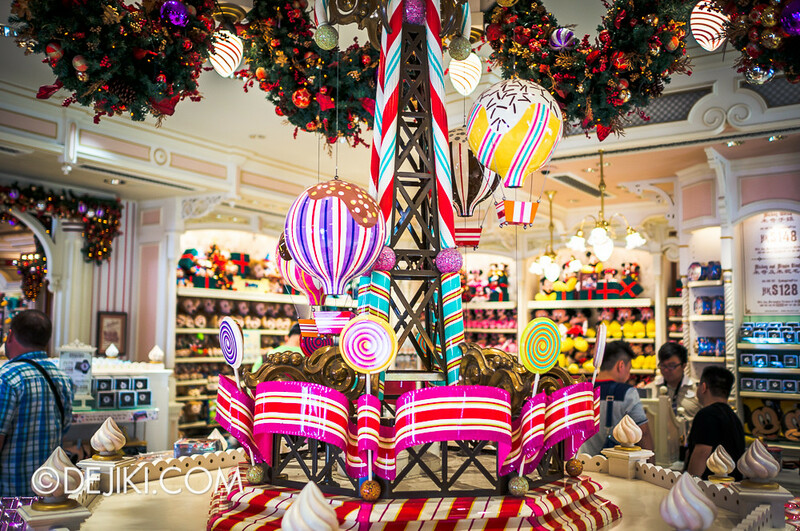 The good thing is, items in Hong Kong Disneyland are more reasonably priced than in Tokyo Disney Resort. 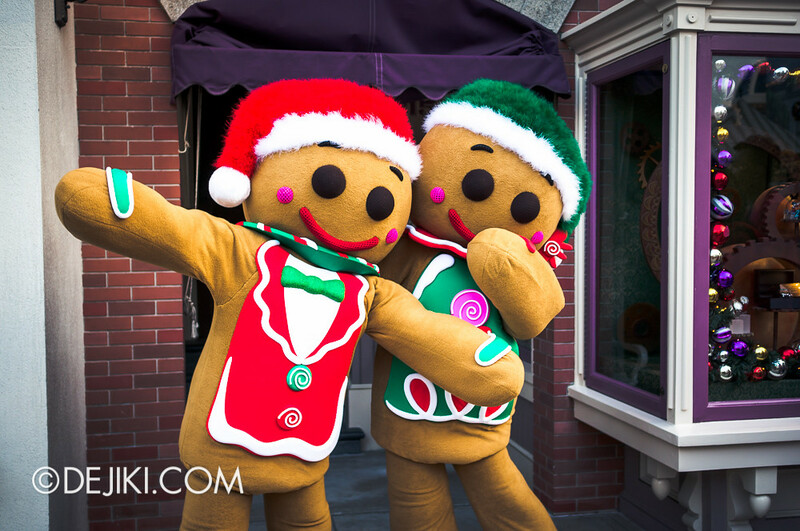 Apart from Disney characters in Christmas outfits, don’t miss the Elves, Duffy and Gingerbread Man (and woman)! 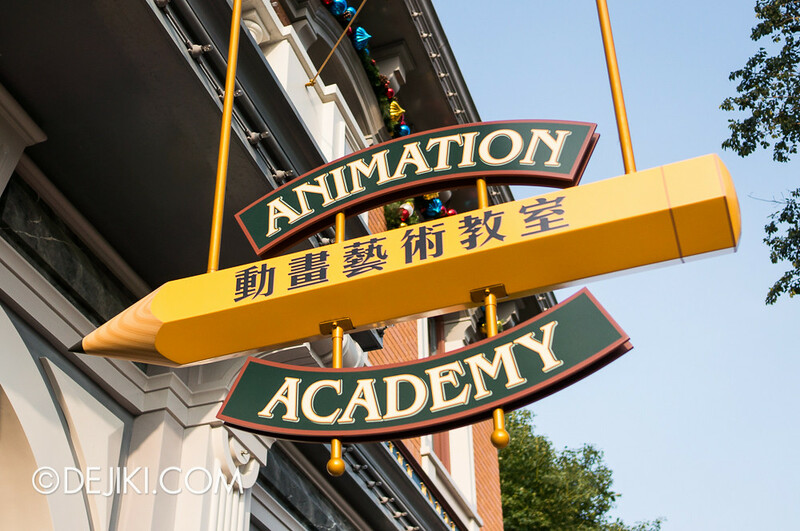 Animation Academy is actually one of the first few attractions that guests visiting Hong Kong Disneyland will see in the park. 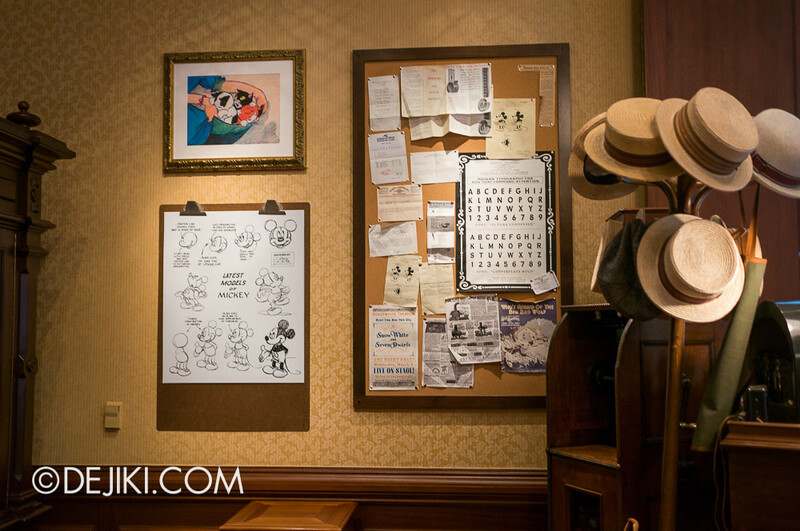 Learn to draw your favourite Disney characters! Why have I never stepped inside? 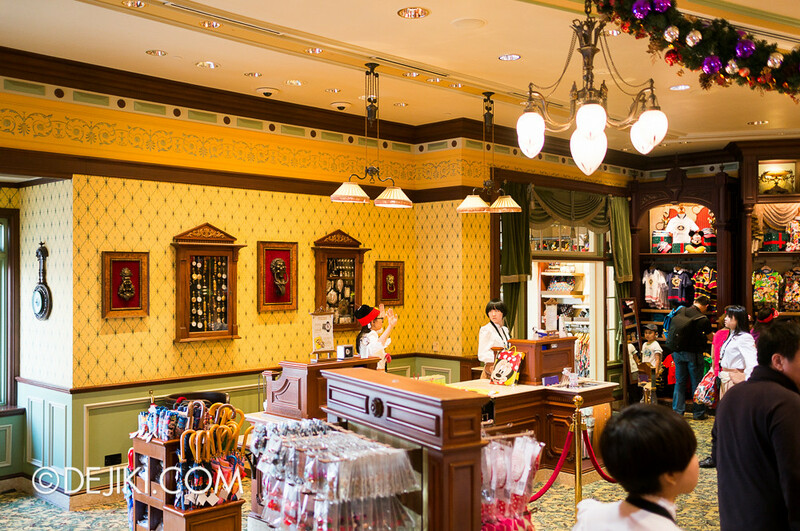 I always thought that the classes, like in Tokyo Disneyland, require payment. 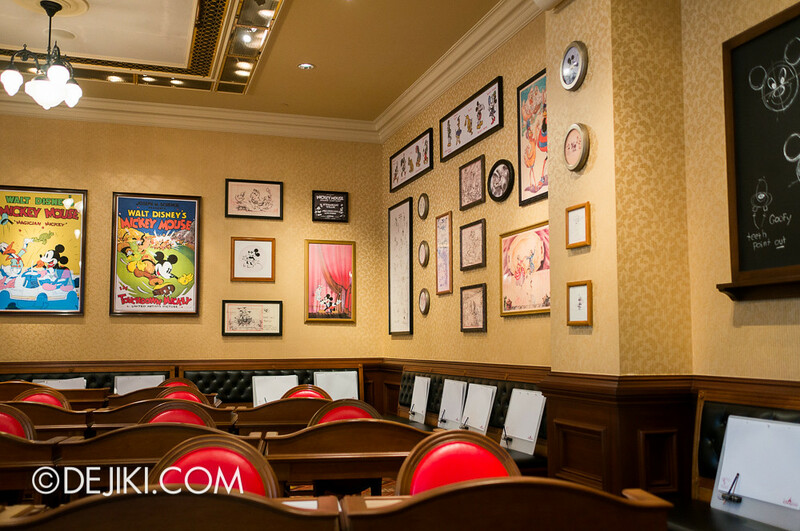 But these drawing classes in Hong Kong Disneyland are FREE. 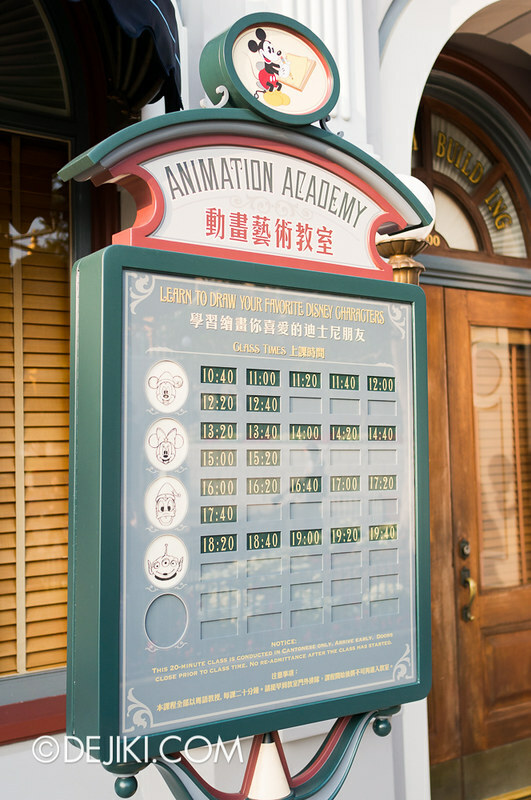 You can drop by the Academy as many times as you wish and learn to draw all the characters offered. 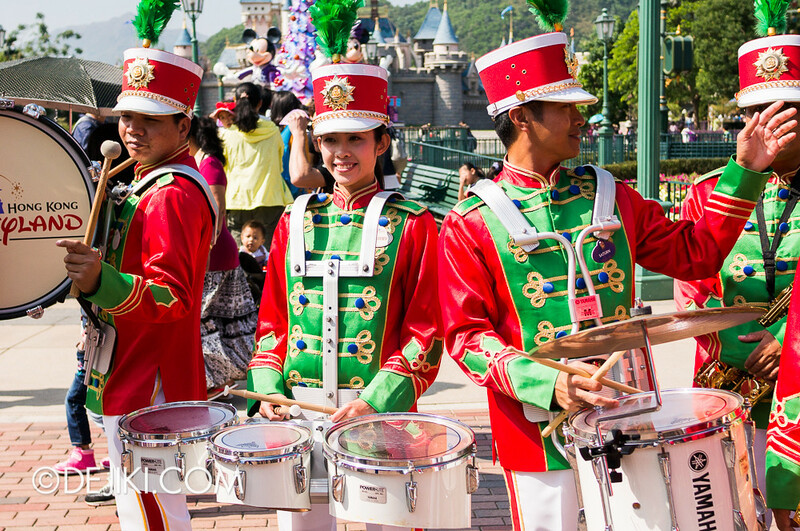 Class time varies, but every day at least 4 characters will be available. 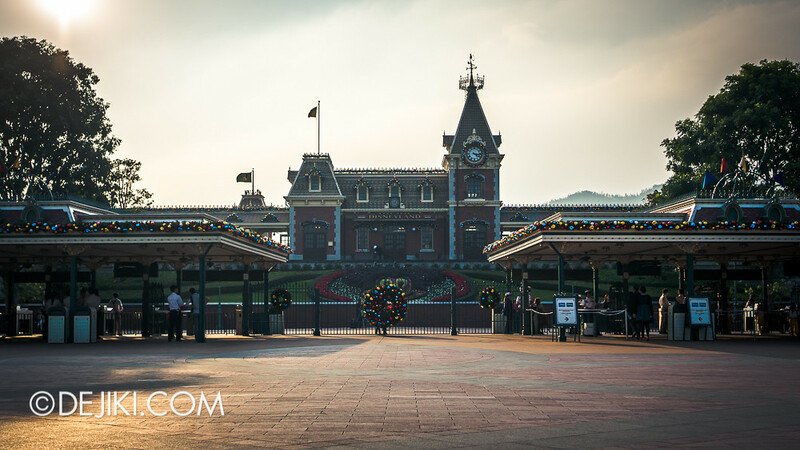 You will learn to draw the face of a Disney character in about 10-15 minutes! 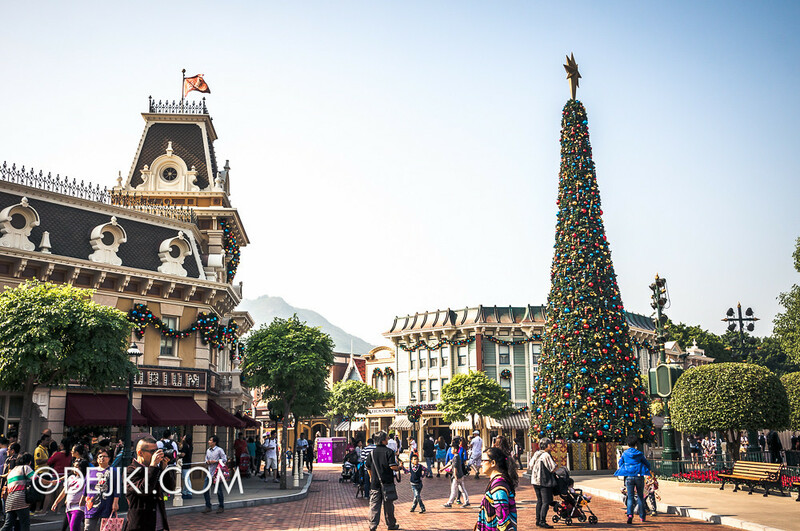 During the day of visit, we attended the Donald (Christmas Hat ver.) class. 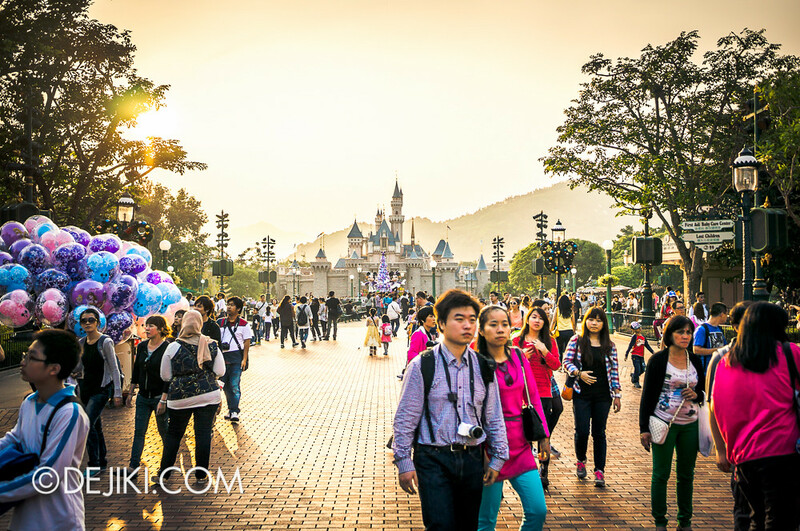 The classes are conducted in cantonese, although they are quite easy to follow. View of the classroom behind my seat. Pencils and a sheet of paper (with this unique logo) will be provided. Erasers, however, are not. Therefore, always start drawing faint lines first! 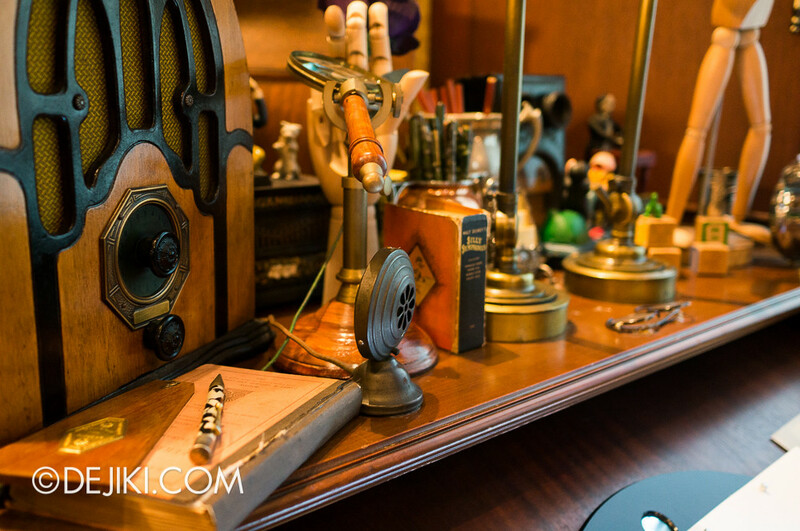 The instructor’s desk. There is a live video feed showing the instructor’s movement on paper, so basically you just have to mimic what’s displayed on the projection screen. 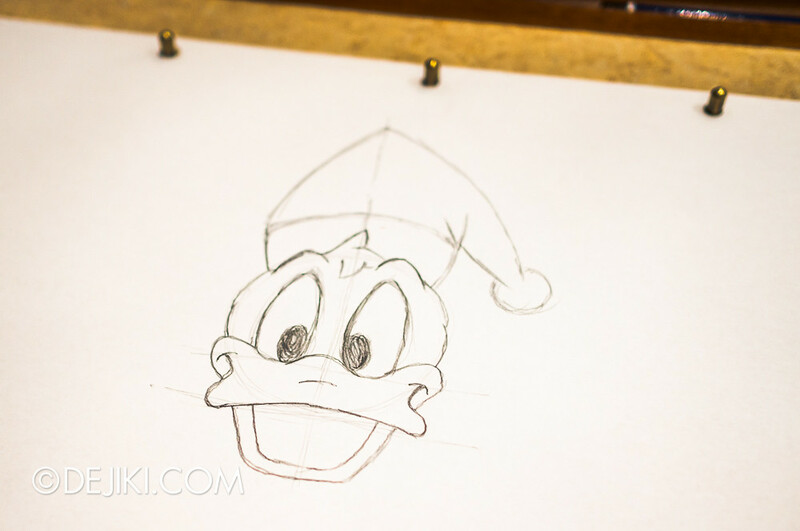 An in-progress shot of the Donald Duck I drew during the class. OH DEAR – looks more like an unauthorized character. 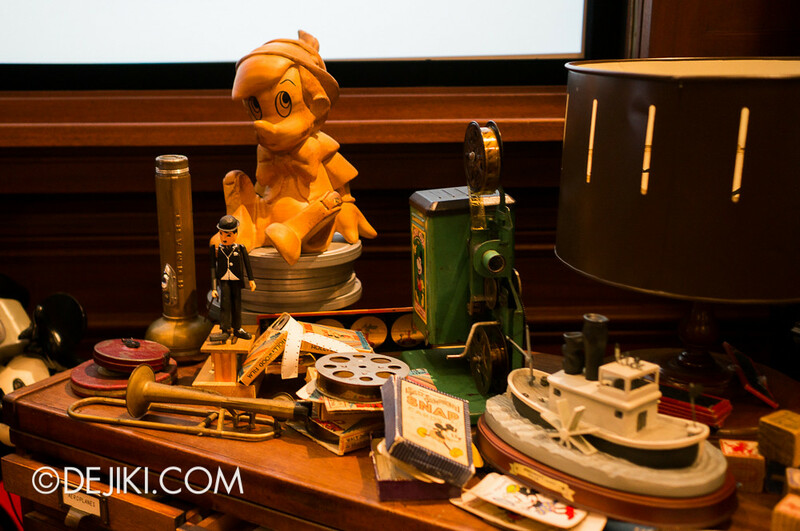 Lots of lovely props (can you identify which classic shows they were from?) lying around the front of the classroom. 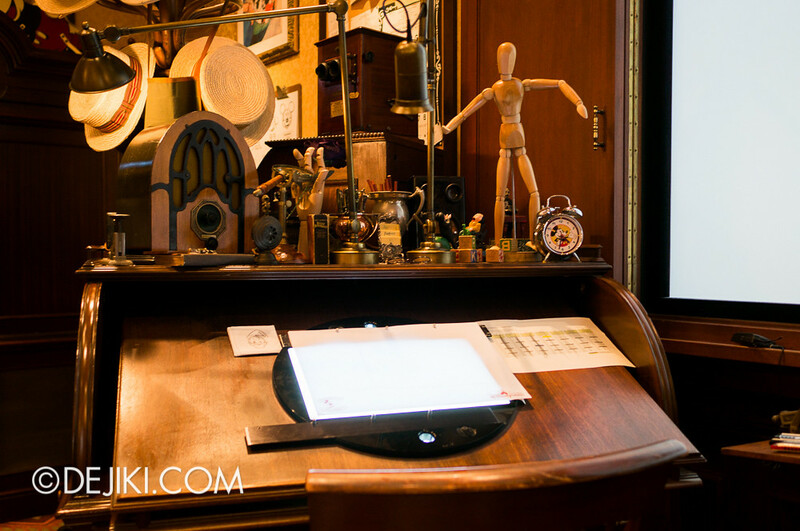 Anyway, you get to keep your drawing in the end – whether if it’s portfolio-worthy or not. 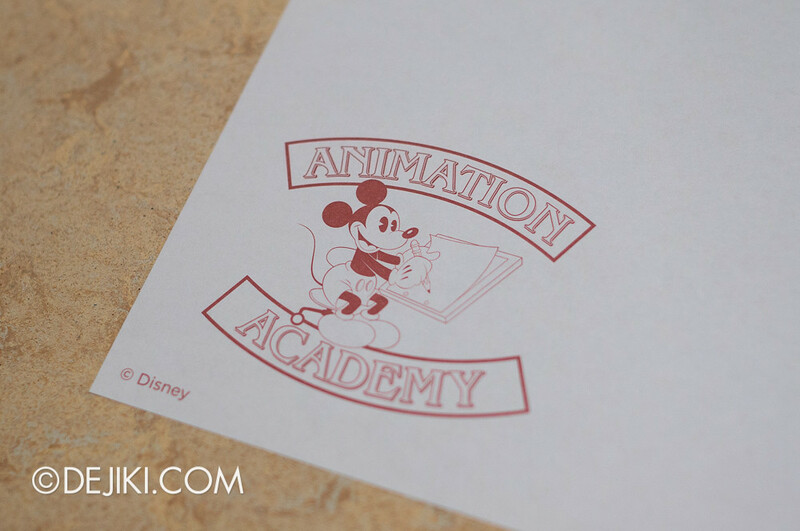 Free souvenir (and it’s a cool experience), so remember to check out the Animation Academy next time! 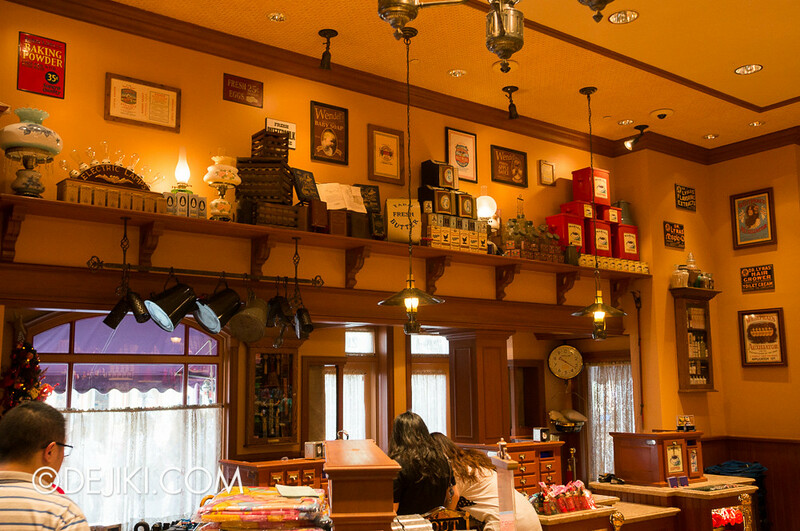 Interestingly, our favourite restaurant in Hong Kong Disneyland was recently rebranded into Main Street Corner Cafe hosted by Coca-Cola. 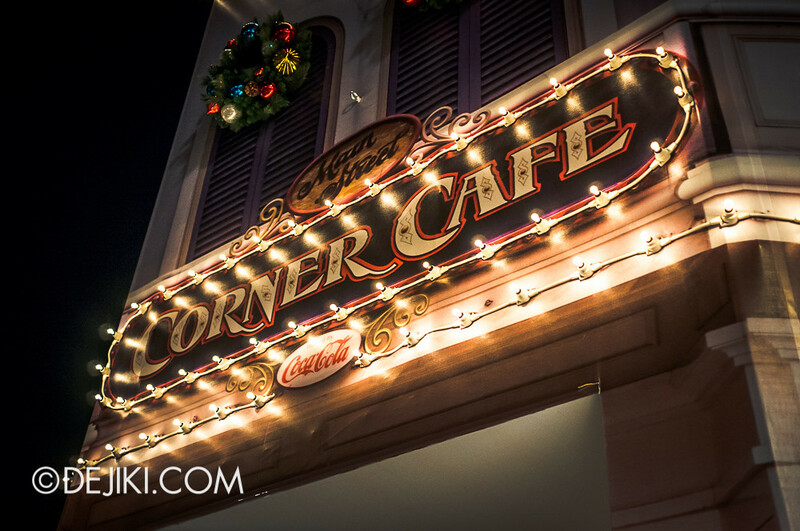 For this trip, we were introduced to the Main Street Corner Cafe Coca-Cola Christmas Menu and had the set for dinner. 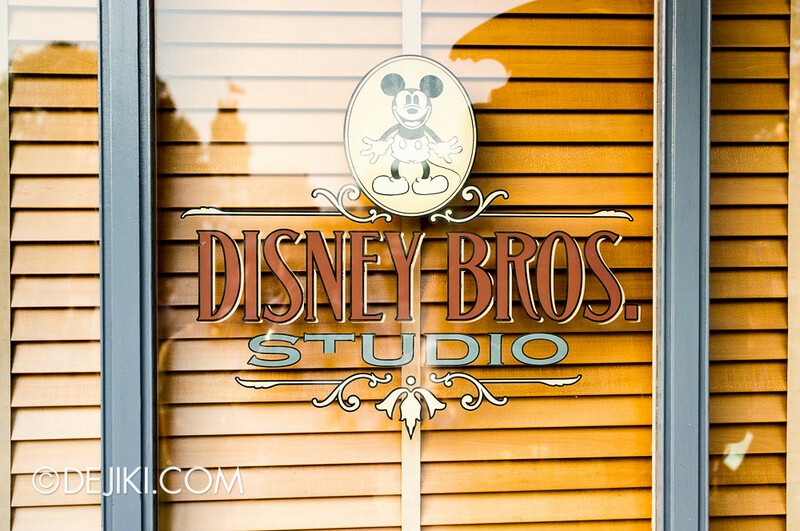 The beautiful sign became 2D due to refurbishments at Main Street. 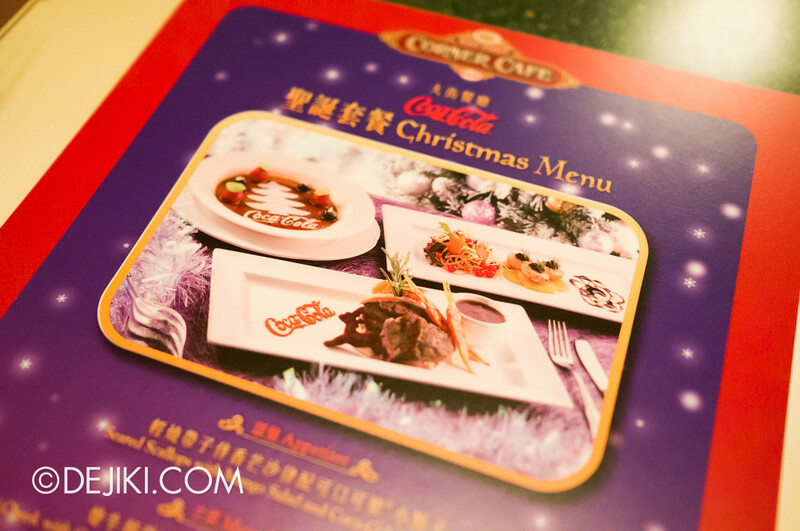 The Main Street Corner Cafe Coca-Cola Christmas Menu is priced at HKD288 (~ SGD46.50) per set. 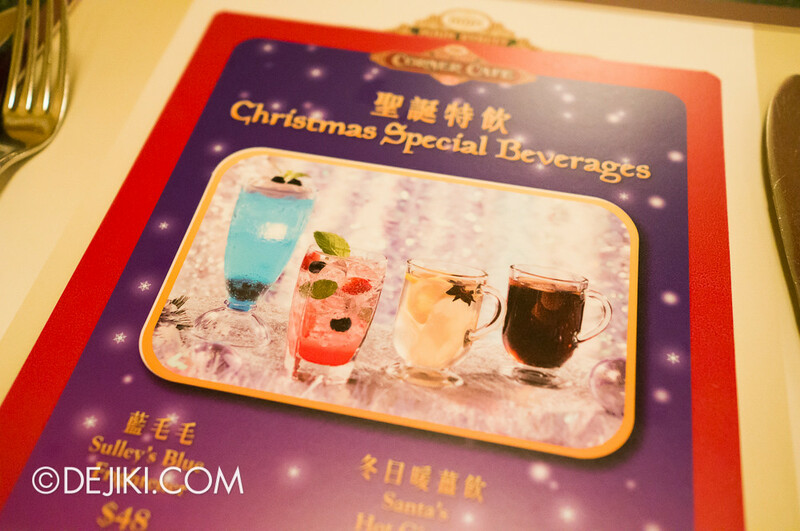 Special Christmas Beverages are also available as a HKD22 (~ SGD3.60) add-on. They are more expensive if you buy them separately. I’m no food critic, but the idea of infusing Coca-Cola into the dishes is a novel idea. 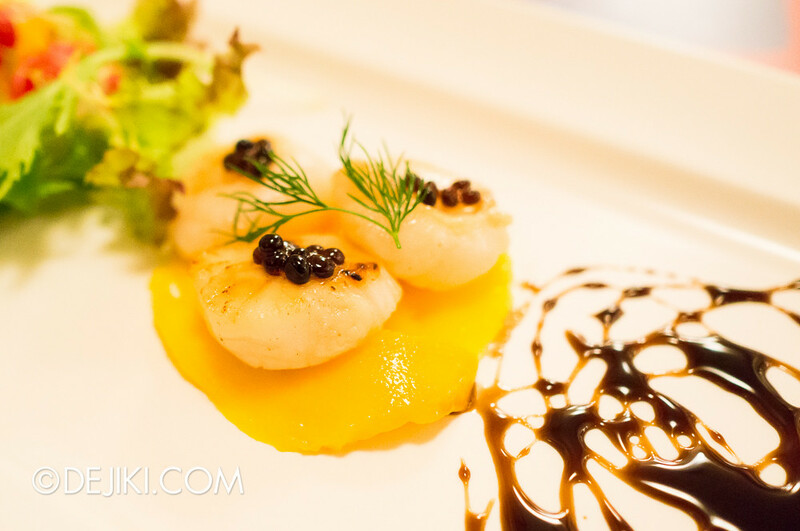 Scallops with Coca-Cola, really? As odd as that sounds, the flavours did turn out well – just imagine the scallops with a taste of honey… that is more Coca-Cola. 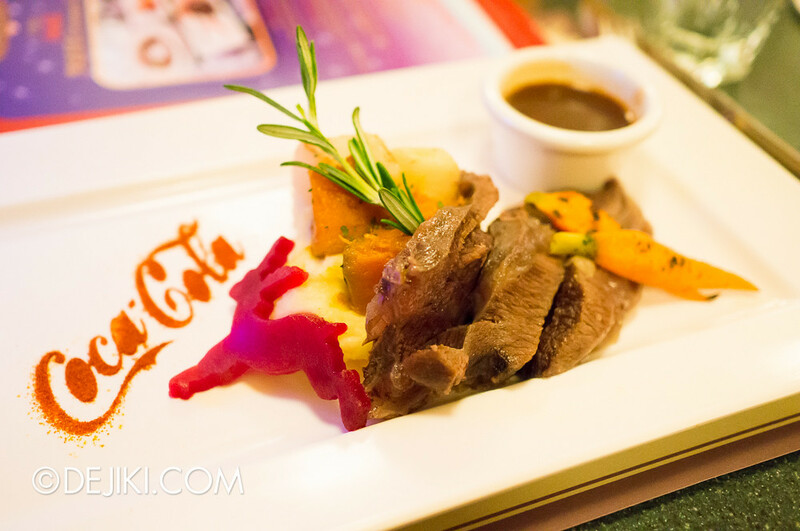 The Coca-Cola Barbecue Sauce went well with the Beef Cheeks. 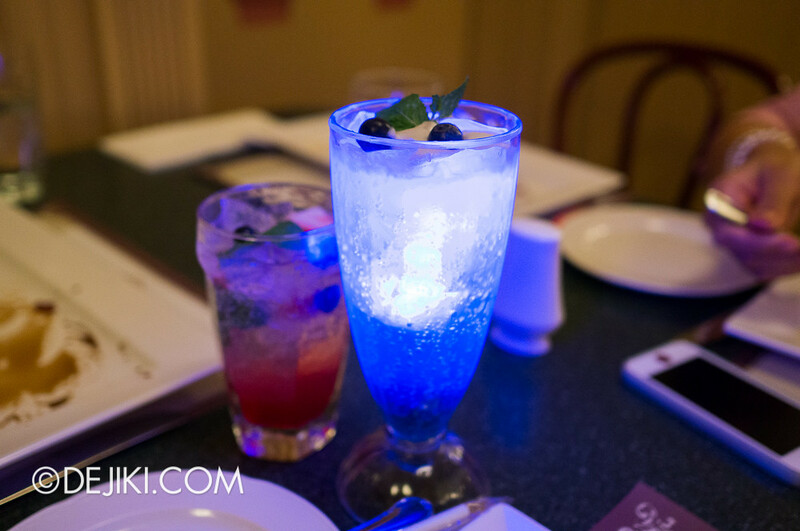 It’s similar to those Coca-Cola marinated steaks. 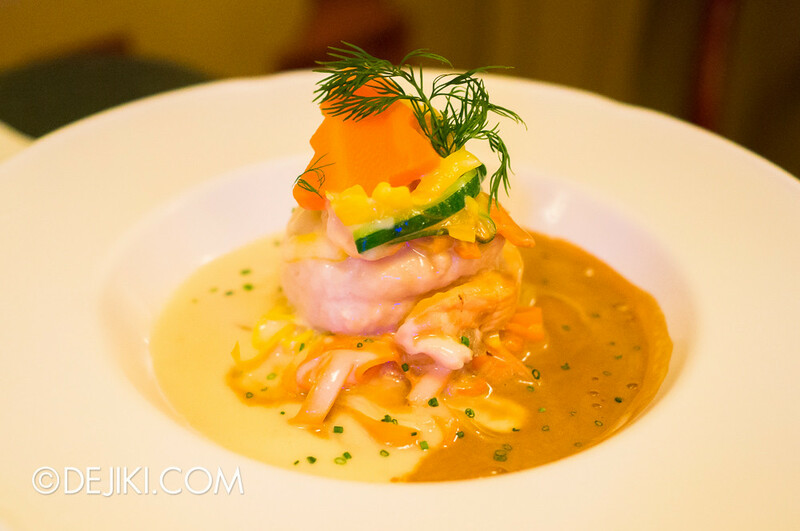 I didn’t try the other main course, but it was fragrant and certainly looked delicious! 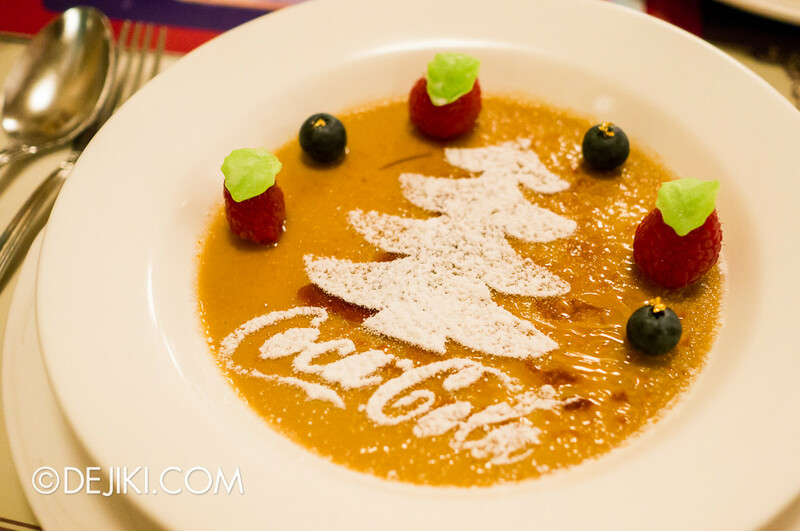 Lastly, Crème Brûlée à la Coca-Cola was good, topped with a thicker-than-expected layer of Cola-rich caramel. But if you love your Creme Brulee crunchy, you will love this. The custard layer is very short, so this is really a sugar-happy end to the Christmas meal. Anyone who loves the Coca-Cola (me!) should enjoy this Christmas set. 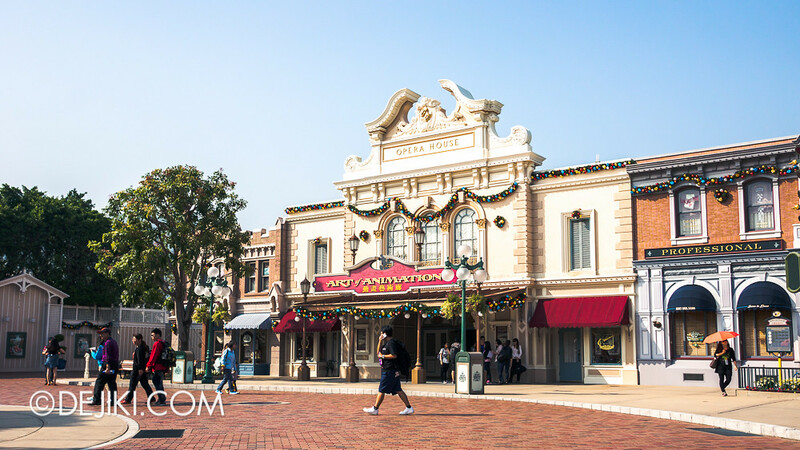 Find out more about Main Street, U.S.A. in the 2012 feature. 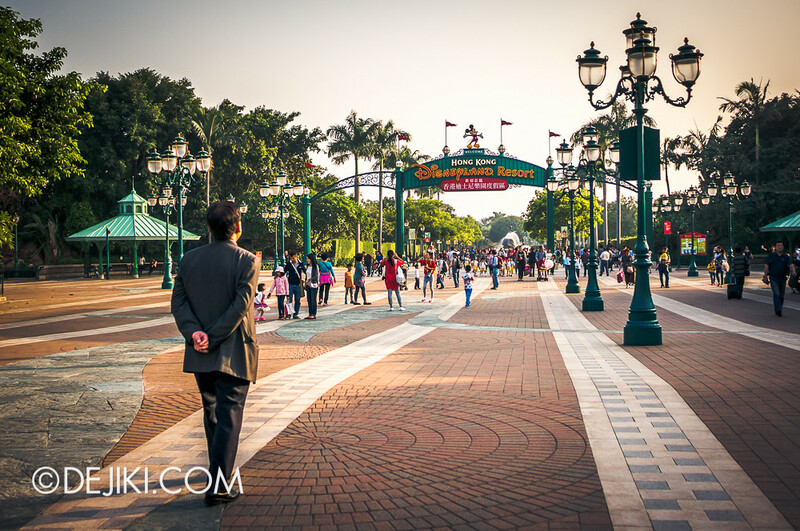 Anyway, we’re not quite done with this part of the park yet. 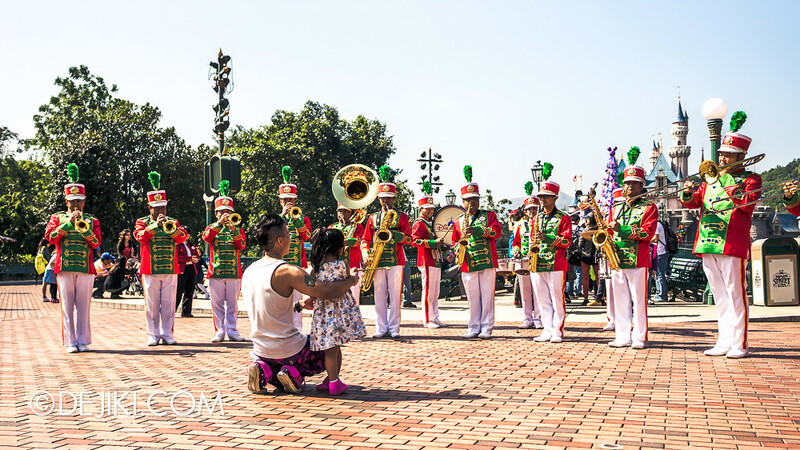 I hope you’re ready for an uplifting spectacle, captured at Main Street!